Astronomy is a fascinating hobby and opens up a whole new world of discovery. The most important tool of the astronomer is the Telescope (although sometimes a good pair binoculars may be used). The most important thing to look for in a telescope is the quality of the lenses and mirrors. Generally speaking, the larger the diameter of the LIGHT COLLECTOR (on a refractor telescope, this is the diameter of the objective lens, on a reflector telescope, this is the diameter of the main mirror), the more light can be collected, and hence the greater the quality of the magnified image. Usually, the more you pay, the higher the quality of the magnified image. This is not always the case though among the telescopes we regularly review. We have chosen our range of telescopes in such a way that they represent a very good trade-off between quality and price. These telescopes are powerful enough to enable amateur astronomists to discover a wealth of hidden secrets in the night sky, without having to pay the earth! AUTO-POINTING Telescopes find objects for YOU to look at! click here! Telescopes for amateur astronomers have now caught up with the digital age, taking the complexity out of finding interesting objects in the night sky. These telescopes use electric motors to automatically point the telescope accurately to 42,900+ objects, such as planets, star clusters, galaxies, nebulae etc. These telescopes can even take you on a tour of the night sky! 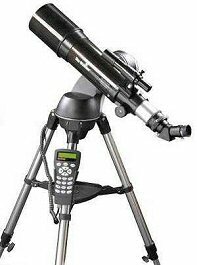 Types of Telescope: There are two main categories of telescope: RefRACtors and RefLECtors. Refractors, use two or more lenses to collect and focus the light from an object to the eye of the observer (or a digital camera sensor), and can trace their design back to the telescopes of Galileo’s era. Reflectors, developed by Isaac Newton in the 17th century, use mirrors to focus the light. As magnifications increase, impurities in the glass of lenses can cause distortion (commonly a “rainbow-like” halo around objects) requiring expensive and difficult treatments and coatings to correct. Reflectors telescopes avoid this problem, and are generally cheaper to manufacture for a given sized aperture (the main lens or mirror used to catch the incoming light). As a result, most high-performance optical telescopes, including the Hubble Space Telescope, are reflector designs.